As hard as we may try, most of us find it impossible to keep a clean house all the time (or even a fraction of the time in my case). 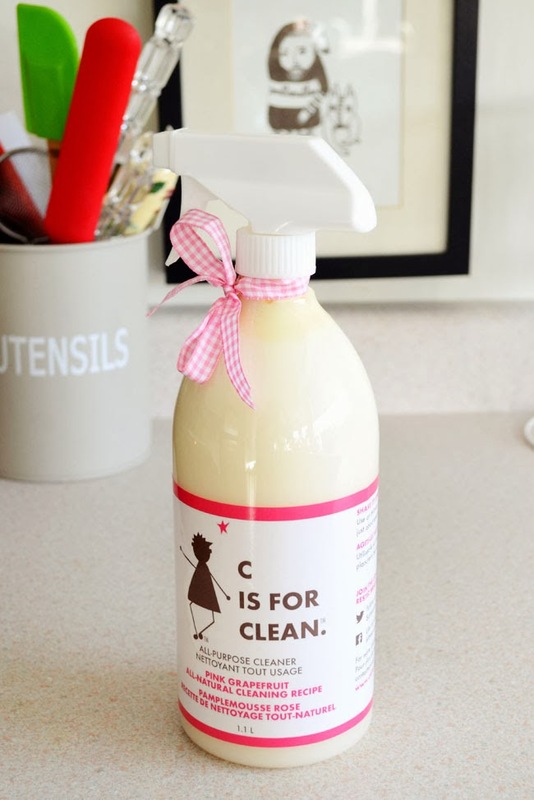 That's why I sought some professional advice recently, turning to cleaning expert Maggie McKeown, the creator of C is for Clean natural cleaners. Maggie, who is also a professional chef, TV host and mother of twin boys, knows what it's like to keep a home for a busy family. She has developed a number of effective strategies for keeping a clean and organized home, and she was kind enough to answer my cleaning-related questions. Unexpected guests are coming over in an hour. What areas of my house should I focus on and how can I clean up quickly? Typically, many of us take what we see lying around the house and jam it into a closet in a full-blown panic. I know - I used to do that! Not so much anymore. Many years ago I implemented something I call “Active Storage." I use my basement storage room not as a catchall, but rather as an organized space where I can access whatever it is that I am looking for. How does this help when the pressure is on? It means I don't have so much stuff hanging around my house cluttering up my space - everything has a place. Reducing clutter is the key to a clean home. It’s easy to wipe a counter and make it sparkle, but if your counter is piled up with stuff that doesn't have a designated place, it can quickly become a big problem. Active Storage allows me to choose what I display and also seasonally change my home decor. Clutter in my space is at a minimum so a quick cleanup becomes a snap! I use a series of shelves in the basement. All of my seasonal stuff is labelled and in bins. I also keep my not-everyday dishes in cupboards. I have lots of vases, etc. (I do a lot of parties) and so I keep all of that on shelves. Gift wrap has its own section. I have different tchotchkes that I don't like to display all at once so I have an area for them. I also have a cupboard for throws and throw pillows. When someone is visiting unexpectedly, I am not in a mad panic rushing to pick stuff up - my house already has a sense of order. Before that doorbell rings I just need to ﬂuff a few pillows and open a window to allow a little bit of fresh air into my home. Plus, in every room in my house I always leave a drawer empty so if I do have to scoot something unwanted away then I have a place for it. How do I tackle the kitchen and bathroom quickly? Nobody ever wants to see a dirty bathroom or kitchen. Make sure to ﬂush the toilet and give sinks and mirrors a quick spray. I always keep an extra set of hand towels in a bathroom drawer ready for such an occasion. It’s just fresh looking and feeling. In the kitchen, my counters are as bare as I can keep them and my sinks are free of any gunk that can be really tough to clean in a pinch. This allows me time to give my ﬂoors a quick sweep and I am ready to go. 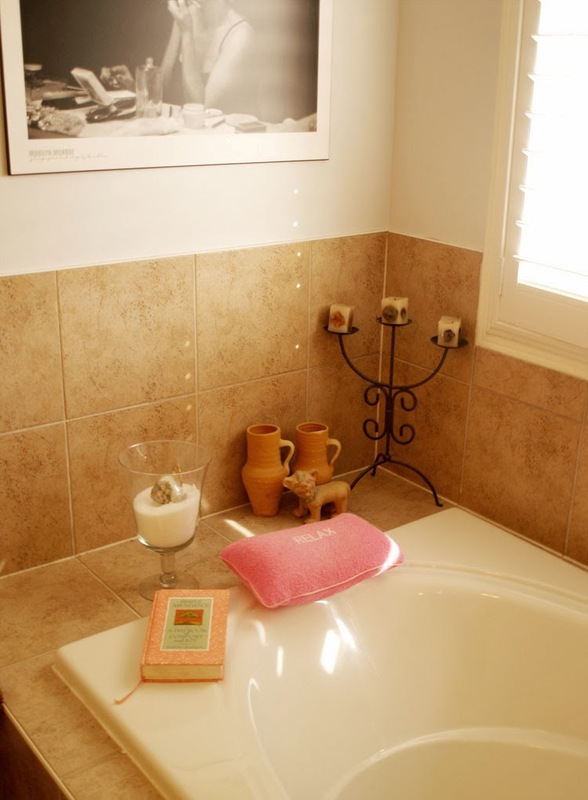 keep my bathroom cleaner under the sink with a clean rag, ready for action. I use my C is for Clean in the toilet, in my sink and on my mirrors. If I have a quick minute and feel really ambitious I will run to my garden and clip fresh ﬂowers or even some pretty leaves so I have something real in a vase. How can I set up my cleaning supplies so I can access them quickly? 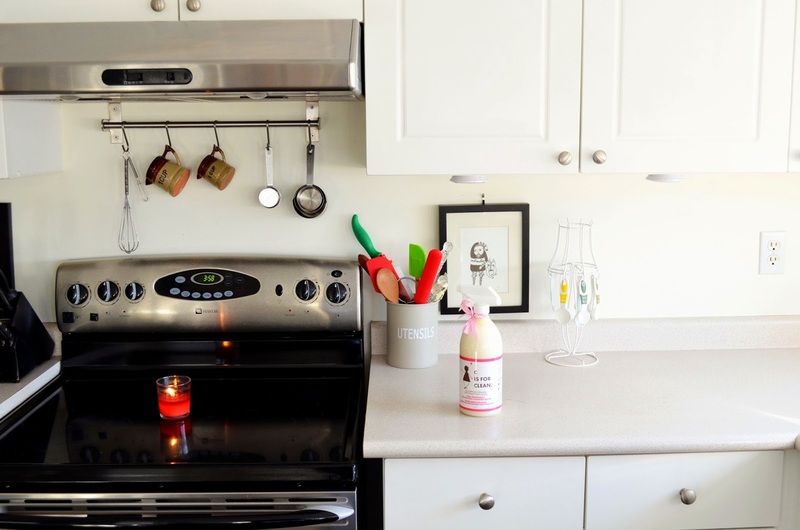 Really minimize how many cleaning products you have in your home. I use one cleaner for almost everything (my C is for Clean, naturally), and don't use separate cleaners for glass, bathrooms, kitchens or ﬂoors. Sometimes the number of different products we have is cramping our spaces and your style! You probably don’t need even half of what you are storing. Be disciplined and keep only what you need. And if you have a speciﬁc cleaner for a speciﬁc room in your home, keep that cleaner in that room. Chef Maggie is an alumna of the prestigious Culinary Institute of America, a successful restaurateur and former national spokesperson for Kraft Canada. She has appeared as an expert on City TV’s Cityline, as a host on W Network’s The Right Fit and as a culinary mentor on the Food Network’s hit series Recipe to Riches. 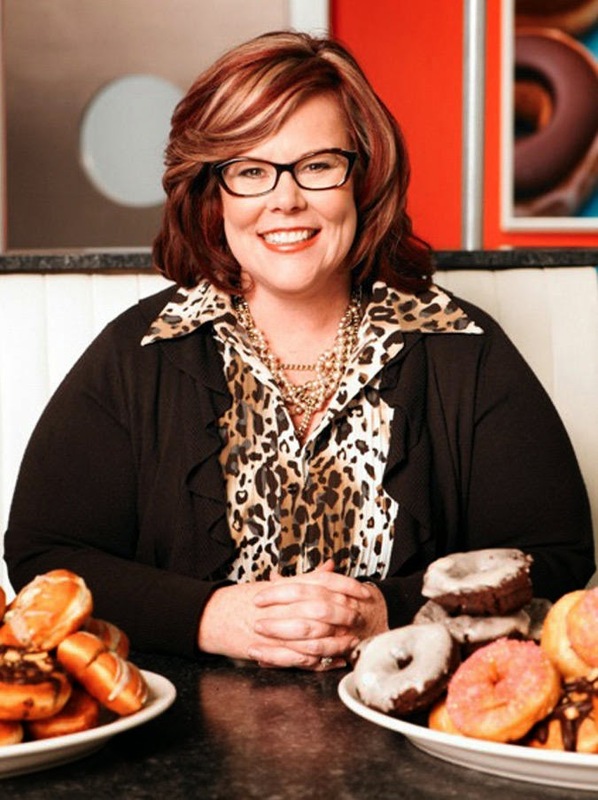 Chef Maggie is currently a judge on the Food Network Canada’s blockbuster Donut Showdown, which airs throughout the U.S. She created the wildly popular C is for Clean all-natural, artisanal cleaning product company using age-old recipes with ingredients straight from the kitchen cupboard. 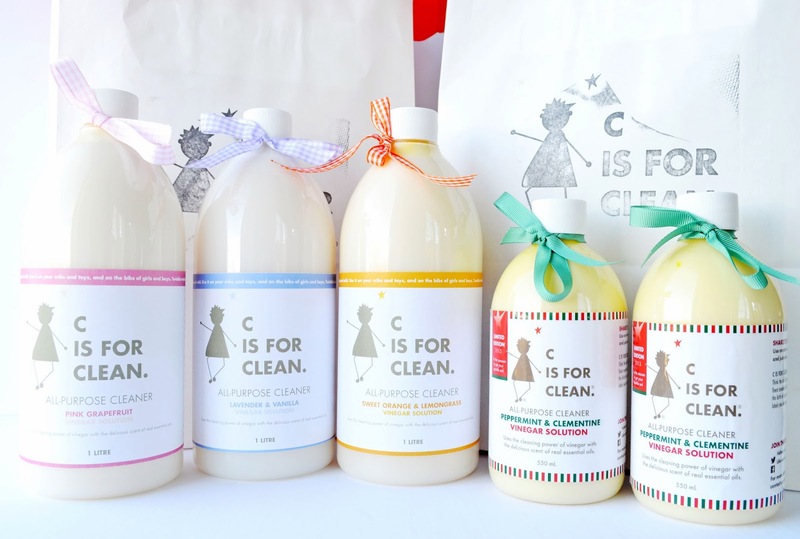 Win $120 worth of C is for Clean products! Maggie has graciously offered to provide one Woman in Real Life Canadian reader with a C is for Clean prize pack worth $120! That's a whole lot of clean! I use these all natural, effective and deliciously scented (with essential oils) cleaners all the time in my own home and I know that you will love them too! They contain no toxins, no dyes, no nasty chemicals, period. So they are safe for your family and the environment. Read my review of C is for Clean products for more information. Enter to win using the rafflecopter below until March 19th. Great post with some really great ideas. I love the idea of non toxic cleaning products! I love that their products don't have any chemicals in them! Yay! oooh great giveway, is it worldwide? I really like the look of the citrusy products like the pink grapefruit cleaner. I'm sorry, this one is Canada only. :( But I believe C is for Clean ships worldwide. I love that they are toxin and chemical free as I suffer from chemical sensitivities. What appeals to me most is that there are no toxins and no dyes. No nasty smells!!! I like that there are NO chemicals. There are no toxins in the products. I like that they contain no chemicals and won't harm the environment. This is the only type of cleaner I'll use now. I'm done with chemicals. love green cleaning products! Nice to have a chance to try C is fir Cleaning out. Thanks! What appeals to me most is that they are made without petroleum by-products. I love that they are toxin-free, but "All-purpose" is what first grabs my notice. I really like that the products are non-toxic. The scents sound great too! That they're super safe, and great for use around a family and children. I most like that they are chemical-free and safe for my pets. What I like most about these products is that they are not bad for the environment. What appeals to me most about these products is the no toxins. I like that they are made with everyday things that are safe and safe for the environment! I like that C is for Clean is an environmentally-friendly cleaning product made by a Canadian business. They look like great products. Cool giveaway. I am super sensitive to chemicals so I love that these are non-toxic! I like that these have no harsh chemicals and are enviromentally friendly. I like that the products are natural and toxin-free. I've never heard of "active storage" before-- what a fantastic idea!! Good luck to all the entrants!! Is it shallow of me to say that I really like the girlie packaging? And I do appreciate that the cleaners aren't full of unpronounceable chemicals. I can't wait to try the Lavender & Vanilla. I love that these products are non toxic and safe for my children and my furbaby!! I love that they use essential oils only and no artifical fragrance. I am so sensitive to some artifical fragrance that they make me feel nauseated. Love that they are not toxic! These looks like fab products. Thanks for sharing! I love that there are no chemicals or toxins. All natural is music to my ears !!! Yay no chemicals in the cleaning products. I love that their products are chemical free, as I try to use only eco products! I love that they are chemical and toxin free! I love these cleaners. Smell nice and clean awesome. I like chemicle free stuff! For me it's the fact there is no toxins!!! I'd love to try...thanks for the chance. LOVE the fact that they are not harmful to the environment! I love that their products are non toxic. I like that they have no nasty chemicals! I love that the products base is vinegar. Nothing in my ome can be damaged by that natural germ-fighting cleaner. I love that they're chemical free and use vinegar. I like that there is no nasty chemicals because my kitten gets into everything! Especially right after wiping down a counter top or cleaning the floors, she is all over everything! I worry about her cleaning her paws afterwards with chemical residues & getting sick from it! Love the idea that they are chemical free and leave a good smell in the house instead of chemical smell. I like that there are no chemicals whatsoever! Great for cleaning while you are pregnant and have kids around! I love that the products don't have any chemicals in them! I love that their are no chemicals in the products. I like that they don't use harsh chemicals. I love that they aren't harmful to the environment, and that there aren't any harsh chemicals in their products. That is a must with a toddler around. I would love to use cleaner products that don't have hazardous ingredients. I love that they don't contain harmful ingredients. The packaging is cute, too. There are no toxins in the products!!!!! I love the scent options because strong chemical smells give me headaches. I like that it is an all-in-one multi-purpose cleaner. That they are Free of harmful toxins and chemicals! I have little kids and pets so this is very important to me! I love they are free of chemicals. Also they are natural ingredients with essential oils. I like that there are no chemicals and they are good for the environment. I like that the company was started by a mom, with families in mind! No nasty chemicals period! I like that, right to the point!